mxl | Another dot in the blogosphere? The end of the teaching semester comes early for me. While most of my colleagues are just starting theirs, I facilitated the last MLS125 class for the year [open Edmodo feed]. Hey, I started while my colleagues were on vacation, so it is only fair that I end while they have to teach! But that does not free up the semester for me as I have a heavier speaking schedule than normal. Oh, and there is that being a head of CeL thing. The end of every teaching semester brings me joy and sadness. I am not happy that any course is over because I love what I do. I am happy if I know I have made a difference. I was particularly touched by the end of course reflections, the email thank-yous, and the encouraging words outside our classroom. This semester was unusual in that I had a larger class than normal for MLS125. That made it harder to connect with more individuals. But there was a dynamism about this particular group that was qualitatively different from my other batches. They were more ready, responsive, and reflective. 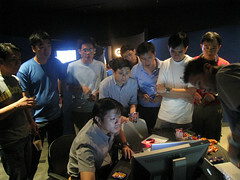 They were more tech-savvy (as each batch of HOD ICT seems to progressively be.) They were also younger. Despite this, they had the wisdom more battled veterans. As with each iteration of the course, I tried something a bit different while keeping the core the same. I stuck to game-based learning as a shared experience for uncovering the principles of change management. I used flipped presentations as a means to get them to experience change from a learner’s and practitioner’s point of view. This time round I provided less scaffolding and updated a few resources. What would I change about MLS125? I would make it even more experiential than it already is. If there is one regret, it is that I am likely to lose the venue, the MxL, because it will be repurposed by the end of the year. While I could conduct the class elsewhere, the place embodies change with its flexible space and relaxing ambiance. The course is not likely to be the same if I have to move it elsewhere. But this obstacle might be an opportunity. There are changes that you instigate; there are those that are thrust upon you. I will just have to rise to the occasion and take the opportunity to walk my own talk. Will someone please marry BumpTop and a low-cost surface computing surface already? Hey, we might do just that at the MxL! All four of my classes have started their journey on educational/serious gaming by this week. We focused on Flash and Wii-based games. I am thinking of getting some handheld gaming devices and games for the next semester as this would make me less reliant on the MxL as a venue. I would like to get Nintendo DS and Sony PSP games that might have some educational value. So to all out there I ask: What are your recommendations and why? To my trainees I ask: What you think of the MxL and your experiences there so far? This week marked the end of the first round of walkabouts at the MxL. We continue with another round next week. What are walkabouts, you ask? I conduct walkabouts by getting my preservice teachers to present their final projects in a less conventional manner. They are assigned a booth at the MxL and they can set it up any way they wish. I think the more important question is WHY I prefer walkabouts. I have a few responses. I firmly believe that teachers tend to teach the way they are taught. So one of my goals has always been to model alternative principles and processes. I have nothing against traditional presentations. There is a time and place for them as long as they have a clear purpose. However, traditional presentations tend to be (but are not always) summative in nature. This week’s walkabout was formative as it was designed to allow the presenters to test their ideas and to make improvements. Traditional presentations require presenters to showcase weeks of work in a very limited time. They also require the audience to sit through presentations that may not be of interest to them. The Q&A that typically follows is also limited in terms of time and scope. I think that a walkabout allows the best aspects of traditional presentations while allowing for more meaningful learning to take place. 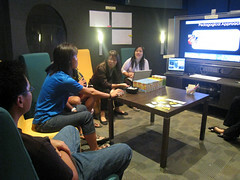 The non-presenters can choose which projects to listen to and participate in. They presenters can take as much or as little time as they wish (within reasonable limits, of course). In other words, this approach is not one-size-fits-all. The presenters get to present several times and over a longer period of time. They have to think on their feet more often as they respond to questions and attempt to engage their self-selecting audience. They interact with smaller audiences so they can address their needs better. In other words, presenters have to step out of the mindset of what I like to call PowerPoint-pedagogy (blindly following a rigid sequence regardless of the need at hand). They can also get more critical and relevant feedback as a result of a more intimate setting. Finally, the walkabouts allow me to contextualise the presentations in two settings. First, as a presentation to teachers from the same cluster of schools in Singapore. I think that this context helps preservice teachers to think more like full time teachers and less like students. They must be more attuned to what and how other teachers think. Second, the walkabout was a way of celebrating the end of the course. As my trainees were allowed to bring refreshments, they could feed their audience’s minds and bodies! Furthermore, this air of informality might relieve some stress of presenting a project. I look forward to the walkabouts next week. I hope that my preservice teachers do too! One of the things that we are working on at the MxL is multitouch technologies. This means that users simply use their fingers to create and manipulate objects directly on the computer screen. There is no need for a mouse and keyboard. This is evident in the Apple iPhone and Microsoft’s Surface (video of the latter above). Sadly, Microsoft did not highlight any educational uses of Surface. I think that such technologies can transform education in positive ways. 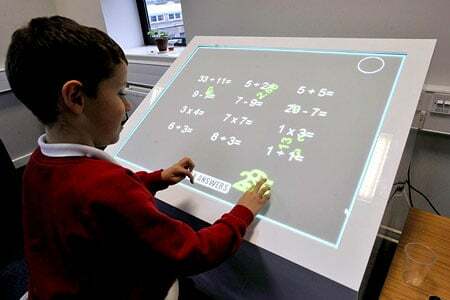 This was why I was excited to read today that a UK university is developing multitouch desks for students. Dr Liz Burd, Director of Active Learning in Computing at Durham University, said: “Our vision is that every desk in school in 10 years time will be interactive”. My take? I think that it is unfortunate that the shorter article decided to show a photo of just one child using it and using it for what looks like drill and practice. This technology has the ability to facilitate true and real-time collaboration and to enable tasks that are more complex and worthwhile. I wonder if we can beat the UK folks to it? We already have our own prototype in the MxL (see image above)! Technologically, we might if I can find the right collaborators from local universities and polytechnics. Pedagogically, I am certain we can if I can find enlightened and energetic teachers and school leaders. I have spent much of this week with my trainees discussing their demo topics and rehearsing in the MxL. 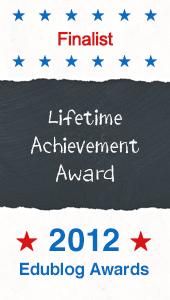 I am hoping that this activity gives them some insight into effort required to prepare resources and to plan for and implement a 20-minute activity. It gets them to wear the hat and walk in the shoes of a teacher who has to integrate technology. 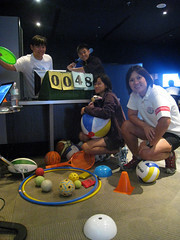 Best of all, I think that their demos jumpstart the process of thinking about their lesson ideas assignment. They can either develop the ideas they have already started with or adopt an idea presented by a peer group.